I was shocked at Diana's recent monthly vid. on her cone winder. She has mentioned my blog on occasions and now it's my turn to return the favour. Of course I recognised the family resemblance immediately I have it's great, great, great grandparent. And it comes with it's own special story - of course it does. It goes like this. My friend gave it to me. Initially I said - Oh No! I can't just take it, I must give you something for it - Oh no, you must take it, I don't need it anymore, I bought a new one. OKOK says me. So I take it home and rapidly going off the idea of giving money for it - and then I used it... OK that settles it, I should have been paid to take it away. Here we have the transformer. 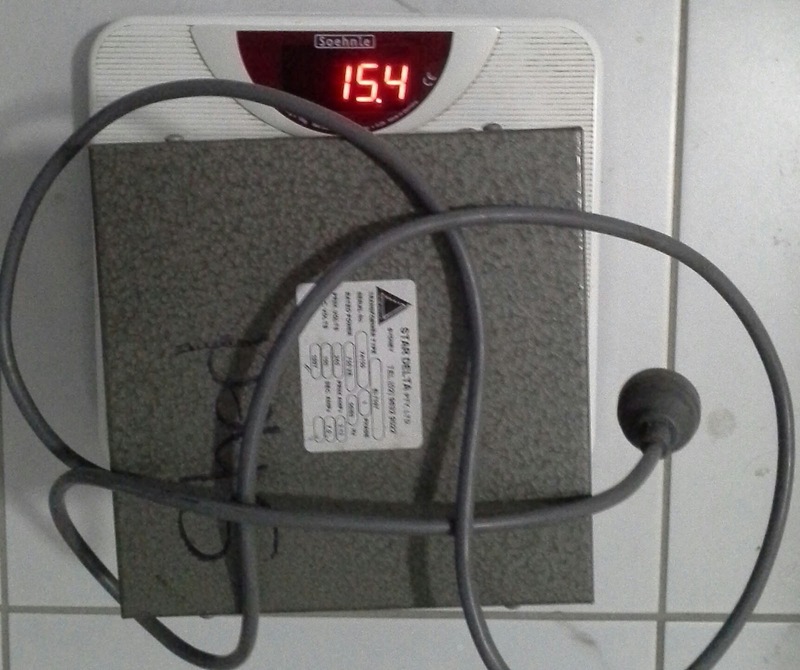 Which is, as we all know necessary to transform our 240V into something great grand dad can use, I put it on the bathroom scales so you can get an idea of it's weight, 15.4 kg, which is about 34lbs in the old money. Very, very heavy and all care must be taken not to drop it on my toes, the tiles, the cat etc. etc. Once over that shock, no pun intended but it does have have that lovely 1950s hum, which I'm sure you all remember - if you need a reminder - just the opening seconds of the Beatles I Feel Fine will give you the sound it makes. But for as long as it's on. And now for the unit itself - no knot turns it off next to the switch, no that would be my toe.. and the lovely new improvement of the yarn feeder to the cone... well I did have to bend mine a little bit to get it to work, really it looks like an old bit of bent coat hanger wire..
And it's sooooooo slllloooooowwww, 30 minutes to wind (beautifully wind I might say) 100g of the 2/28 that I need to wind off for a blanket.. while holding the yarn - just so - above it, while operating the patented on/off knot detecting foot operated switch. So while I don't envy anyone anything, I just thought I'd like to share The World's Worst Cone Winder That Winds A Very Nice Cone (Mostly). 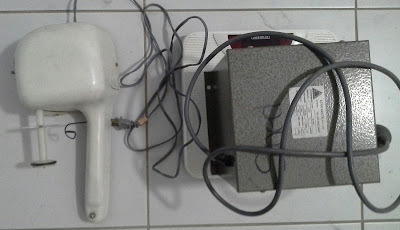 And the 15.4kg transformer that the 1950s called and wants back to operate some Cold War spying-dogoodery, but was highjacked instead into a cone winder. Now while I have every respect for Diana, and her blog, I wasn't sure that the added bits along with her nice lightweight transformer were appreciated. Really now, aren't you all glad I shared. My new winder has no transformer or converter, just an ordinary plug, and it's light. Of course, I'm in the U.S. It winds a skein up quite quickly, much faster than my old favorite jumbo winder. It really feels a little fast to me, at least if I'm working from hand knitting skeins, which always have some tangling or stuck-together spots. Oh that's just not fair!! That transformer has got to be lifted to be appreciated!! Oh it's slow, however, winding off the 2/28 onto a cone is a must and it does it best. I like the hand winder for thicker hand knitting yarns, toilet roll innards fits right over the top of my old one and I knit straight from that. But its not good enough for the 2/28. LOVE this! You have a gift for description. And perhaps with this in mind, I won't try to progress beyond my current hand-operated cone winder, a little Rocket from the 1950s that will only allow a certain amount to be wound (never enough).